Social studies, environment or maths teacher? Into your stats? 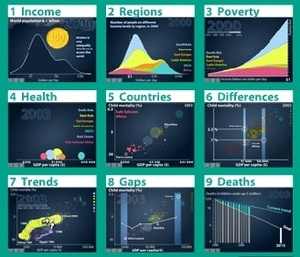 I meant to bookmark Hans Rosling, professor of international health at Sweden's Karolinska Institute, speaking at TED much earlier than this, but the video of his talk is second only to the Gapminder application he was using to illustrate it. Watch the talk first, then download the Gapminder human development tools for your social studies classroom. You want to see the divides and similarities in our world? I think this is the best representation I've seen using real UN data over a relatively long period of time, combined with the visuals offered by Flash that allow an individual to see the whole picture and the detail all at once.